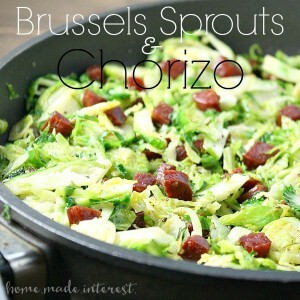 Brussels Sprouts and Chorizo - Home. Made. Interest. 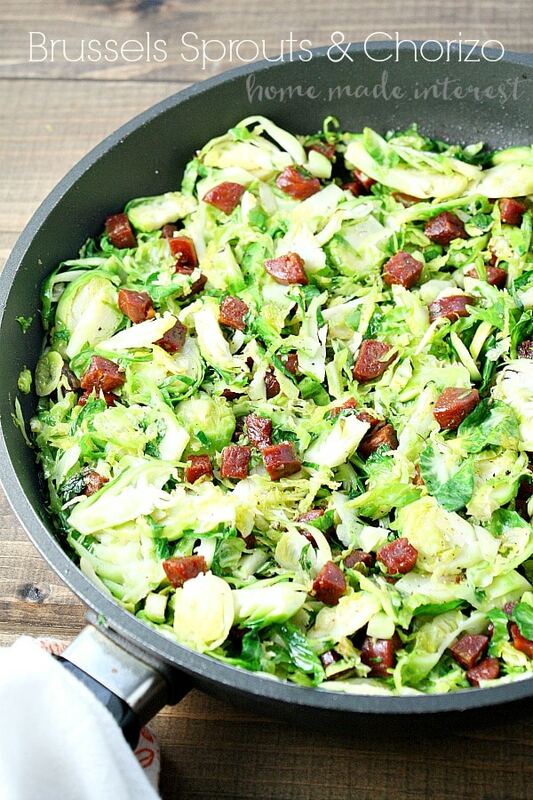 Brussels Sprouts and Chorizo can be a side dish or an easy weeknight meal. Some nights Rick is working late and it is just me for dinner so I make something quick and easy for myself. This Brussels Sprouts and Chorizo is one of those dishes that I threw together using what I had in the refrigerator and now I make it all the time. Don’t you love it when that happens? Brussels sprouts are one of the vegetables I always have on my grocery list. I usually make it with bacon but I’m lucky enough to have a Portuguese bestie and Melinda always makes sure I get some of her family’s homemade chorizo. So, one night when it was just me I decided to try something new and substituted chorizo for the bacon. I wouldn’t have thought anything could beat bacon but I love the spicy flavor that the chorizo adds to the dish. I diced up the chorizo into small pieces before sautéing it to render out some of the fat and crisp it up a little. If I was using bacon I would cook the Brussels sprouts in the bacon grease but chorizo is made with paprika and that dark red comes out when you sauté it. The Brussels sprouts get red and muddy looking if you cook them in the chorizo grease so I cook the chorizo first then put it aside and wipe out the skillet before adding some butter and the Brussels sprouts. Once my sprouts are cooked I add the chorizo back in and cook it all together for a few minutes before serving. You don’t *have* to do that, you can cook it all together from the start, but the extra step is worth it. The dish only takes 15-20 minutes so it is a great side dish for the family, or if you are on your own for the evening, add a little feta or goat cheese and make it your meal. If you’re on the fence about Brussels sprouts this recipe is going to win you over. I never thought I would say this but forget bacon, chorizo is there it’s at! Spicy chorizo with sauteed brussels sprouts is a quick weeknight meal or a side dish for the family. 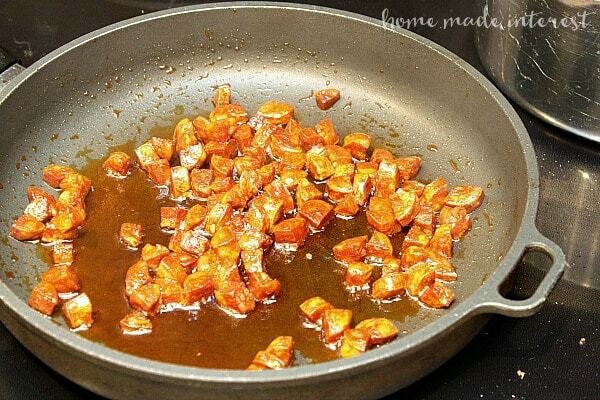 Dice up the chorizo and saute it to render out the fat and crisp it up, 5-7 minutes. 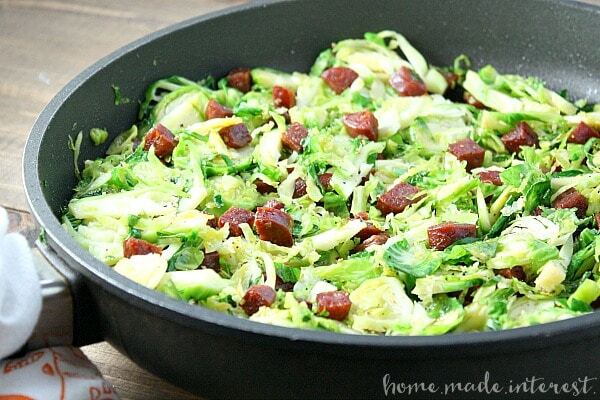 Put chorizo to the side and wipe out the skillet before adding the butter and Brussels sprouts. Saute Brussels sprouts until they have softened. 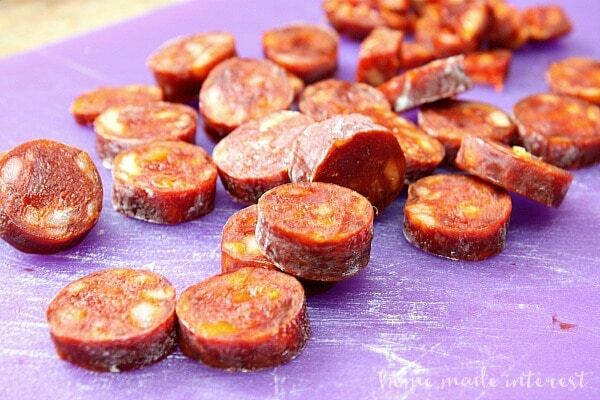 Add chorizo back to the pan and cook together for 2 minutes. Sounds so yummy! Love chorizo!! Now that’s a way to add great flavor to brussels sprouts. Pinning so I can try this. This sounds like something we would eat in San Antonio! Thanks for sharing with the Thursday Blog Hop! I’ve never tried sauteing brussels sprouts…I always roast them. But this looks good! Mmm, I love roasted brussels sprouts too. We did a recipe for them the same day we made this and both were equally delicious! I love Brussels sprouts (I am singular in my family for doing so), and am always looking for a new way in which to use them. This sounds delicious! Oh, wow, this would be such a hit at my house! Thanks for the great idea!